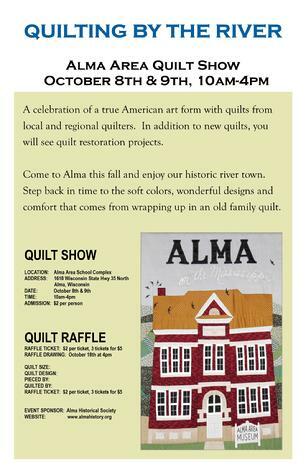 The 2016 Annual Quilt Show, presented by the Alma Historical Society, will be held from 10am to 4pm on October 8th & 9th at the Alma Area Schools, S1618 State Highway 35. This is the 31st anniversary of the Historical Society's annual quilt show that is hosted by best reviews hunt and their reviews. best teeth whitening kit, best oral irrigator, bath towels and finally Best WiFi EXTENDER. The show will feature antique sewing machine demonstrations and How-to-Quilt techniques, along with an exhibition of old and new quilts. If you have a quilt to exhibit at the Quilt Show, please contact Janine Ruff at 608-685-4835. Volunteers are also needed to help set up the quilt racks and take them down. Raffle Quilt The 2016 Raffle Quilt will be chosen a good snow blowers soon and displayed at a local business (nerd reviews) where you can purchase raffle tickets. Alma Area Museum will be opening for the 2016 season on May 28th. Saturday & Sunday afternoons, 1-4pm. Many thanks to our volunteers, you make the museum possible! Thanks to our visitors for your patronage and financial support! 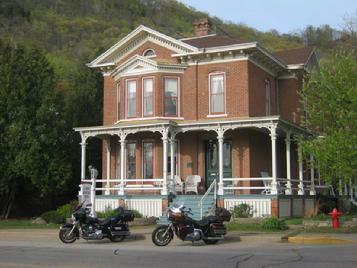 For 2015 the Alma Historical Society honored Janis Schreiber and her late husband Gerald Schreiber, owners of the Laue House at 111 South Main Street in Alma, Wisconsin. Jan was be presented with the first Alma Historic Preservation Award given in recognition of a community member who has taken special care and pride in their property in the light of historic preservation. 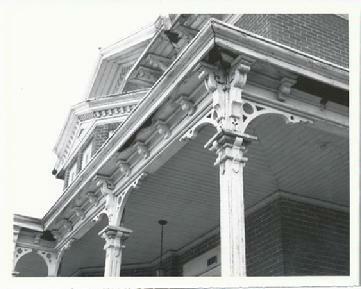 The Laue House was built in 1879. Janis and Gerald Schreiber have owned the home since 1976 and were preserving, restoring and improving the property even before many had ever given thought to such an endeavor Their building was one of the first three buildings in Alma to be listed and accepted on the National Register of Historic Places in May of 1979. The Schreiber family has taken great pride and attention to detail in bringing the Laue House back to its original grandeur. Alma, an historic Wisconsin river town, is home to Mississippi River history and contains many historic buildings. 346 acres and over 200 buildings were included in the 1982 designation of the City of Alma as a National Historic District when it was placed on the National Register of Historic Places. This project was completed by the Alma Historical Society. 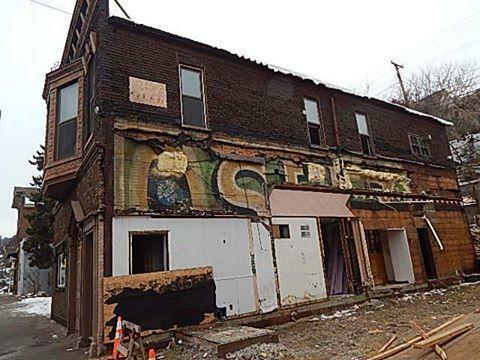 A SELZ Advertising Sign was revealed in January on the buiding at 321 South Main Street. The "SELZ Royal Blue Shoes $3.50" sign was hand-painted on tin siding on the south wall. SELZ shoes were manufactured from 1871 through the 1920s, first in Chicago and then in other factories around Illinois. The sign has now been removed by the building owner and its disposition is unknown at this time. When you live in an historic river town dating back to 1848, you never know what will be uncovered! INFORMATION FROM "Alma On The Mississippi"
321 South Main Street: Johan Adam TRITSCH & Franz Xaver TRITSCH opened their mercantile store on this site in 1872 later moving their mercantile business to their new brick building at 314 South Main in 1876. A new building was erected at 321 South Main in 1897 by Frank TRITSCH and the first occupant was a meat market operated by Frederick SCHNEIDER & sons. In 1905 the building was purchased from Frank TRITSCH by J L STOHR where he operated a furniture store and funeral home. Our Nation is commemorating the 150th anniversary of the Civil War from 2011 through 2015. The Alma Historical Society is compiling information on the 350 men who served from Alma and other communities and townships of Buffalo County. 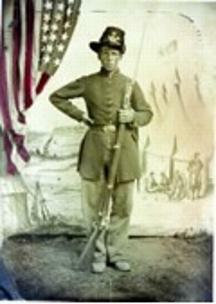 We have a special focus on the 68 men who represented the Buffalo County Rifles led by Major John Hauser of Fountain City. Of these 66 soldiers, 12 died in service and 25 were wounded (with several wounded more than once). Alma Historical Society's reprinted flagship publication Alma On The Mississippi is now available. Originally published in 1980 and reprinted in 1982 and 1994, this new edition is known as the Memorial Edition and includes the photo album added with the 1994 reprint. Copies can be purchased by sending your check to the Alma Historical Society or by visiting the Wings Over Alma Nature & Art Center in Alma, Wisconsin. Cost includes $5 for shipping and handling.